More than 50 volunteers came out on Earth Day, April 22nd, to work for the park. THANKS FOR ALL THE HARD WORK! Joining the many families were Cub Scout Pack 428 and Girl Scout Troop 42956, both traditional participants in our event. 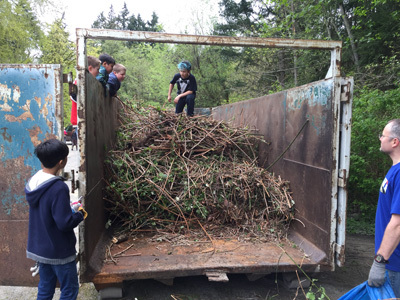 Volunteers worked in groups, removing invasive blackberries; weeding the picnic area and planting native plants; removing invasive hollies; and picking up litter along 116th Ave NE. The Girl Scouts planted a tree for their “tree badges.” The blackberry group nearly filled the 35-cubic-yard dumpster generously donated by Pacific Topsoils! The company has donated a dumpster on Earth Day for many years, and they pick up the dumpster and compost the plant material. Thanks, Pacific Topsoils! The Foundation provided free snacks and drinks, and many stayed for our traditional lunch of Costco pizza, Caesar salad, fruit, cookies, and brownies. Leftover food was donated to the homeless. All in all, this was an excellent volunteer event. And it hardly rained at all! Now Park staff will be able to find and use the loading ramp in the parking lot, which previously was covered in blackberries!